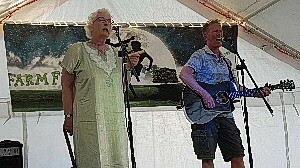 Thompson’s Twins, Liz Lawley and Steve McClennon, finally getting round to singing more than just one or two songs together at the sing-around or the open mic. not to mention a Kelly, a Salley and a Bobbie. Thompson’s Twins perform two 20-minute sets closing each half of the evening.